Hey smarky gamers, it’s that time once again to get hyped up for this year’s edition of WWE 2K. We're just a few months away from the release of WWE 2K19, which should be out by October 9 in the U.S., so we can expect it within a week on our side of the globe. Every year, the 2K team teases the many new additions, features, updates, DLC and many more among others to give gamers something to look forward to and this year is no different. While AJ Styles has already been unveilied as the cover boy for this year’s edition, you might have recently heard about the Deluxe version of the game, aptly named the Wooooo! Edition, which honors 16-time World Champion, Ric Flair, however, that’s not the topic of the day. No sir. 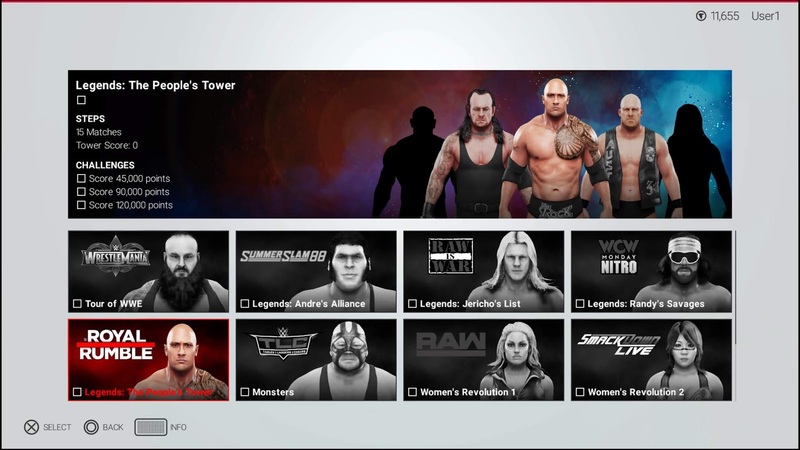 Yesterday's major WWE 2K19 announcement involves a brand new game mode which the 2K team has dubbed as Towers Mode. No, fortunately, the focus will NOT be on Big Boss Man and Akeem the African Dream's old tag team. 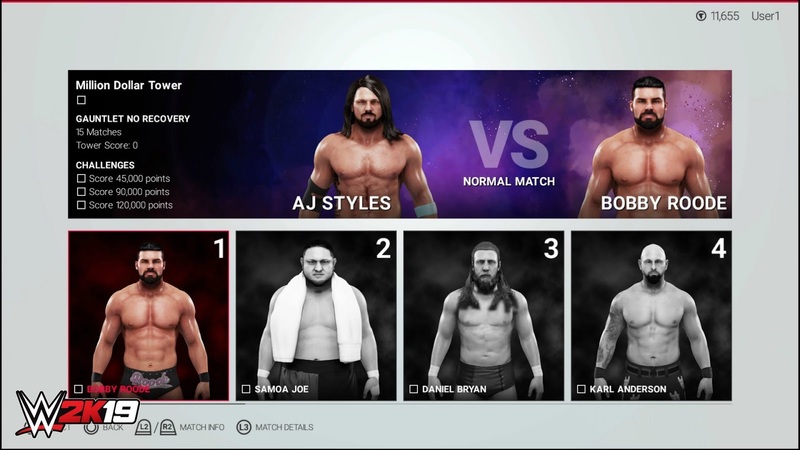 Instead, the new mode is an “arcade mode” of sorts which sees players pick from either WWE Superstars or their very own MyPlayers to compete against a string of WWE Superstar opponents. If this sounds all too familiar to you, then maybe it is and maybe it isn’t. Personally, I think it’s a whole different thing with a whole mix of the good old modes of yore. The influences from this mode are evident. There are two Tower modes available which will play differently from one another. These are Gauntlet Tower and Steps Tower. Gauntlet Tower in itself is heavily reminiscent of the old Slobberknocker mode (or WWE 2K14’s “The Streak,” for more recent fans), where you have to defeat all opponents in one sitting. If you quit, then all progress is reset. Steps Tower is your more traditional arcade mode—more akin to WWF Warzone or WWF Attitude—wherein you climb your way to the top by beating a superstar one match at a time. By the looks of it, I find that this new Tower mode will probably be a mix of (if not similar to) Injustice 2’s Multiverse mode and Mortal Kombat’s Arcade Mode, in the sense that each and every tower will have different stipulations and background history. This will give the player a different challenge per tower. And with the timer on the screenshots, it seems that 2K will update the towers on a regular basis, possibly even daily. I have high hopes for this mode, only because (1) I got bored with 2K18's career mode, and (2) I really enjoyed Injustice 2's similar-sounding mode. Collecting achievements and loot might be more fun when done this way. Tower-exclusive loot is a must for this mode. 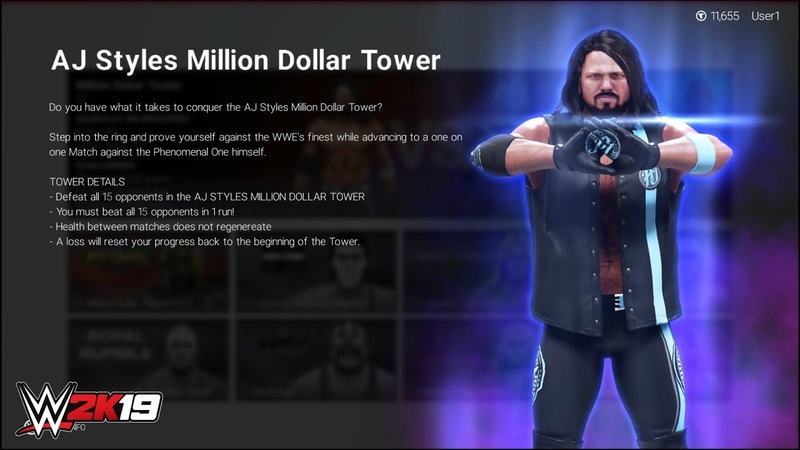 As part of the announcement, 2K has also announced that cover boy AJ Styles will have his own high profile Tower dubbed the AJ Styles Million Dollar Tower, which will see gamers try to get a chance to go one-on-one with the Phenomenal One himself for a shot at winning $1,000,000. I read the rules and it saddens me to say that the Philippines is NOT part of the countries eligible to join this contest. As a lifelong fan and avid WWE games supporter, I seriously think I have a good chance of beating that tower and Styles, but alas, maybe in another time at another place. You can check out the rules for the Million Dollar Challenge and more here. With every announcement, screenshot, and video posted, WWE 2K fanatics dig deep within each morsel of information to uncover features which haven’t already been announced and we’re doing the same for this one as well. Underneath the MYPLAYER’s name, there is a “Striker” designation along with what seems to be his current overall rating. Could this be a return of fighting styles? A logic classification perhaps? Or just a tag which refers to his highest statistic? It’s been said that each tower will offer rewards to be used for your custom avatar. Yes to no more grinding the career mode for lootboxes. That or exclusive tower loot would be great. 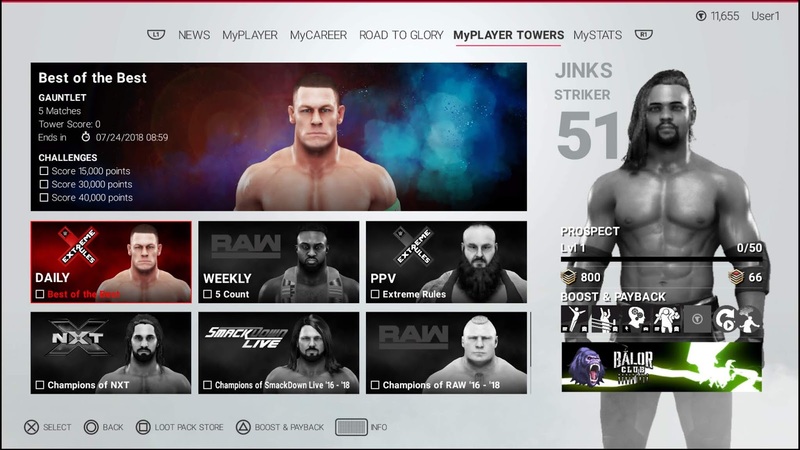 Check out the Bálor Club with a Gorilla logo on the lower right-most corner of the menu screenshot. Could player cards be part of the game now? This or a group/clan would be interesting to see. The 5-Count on Big E's stipulation. Hoping we can use these stipulations on Exhibition Mode as well. I'm personally looking forward to this new feature as it adds a new layer and allows us to enjoy playing the Career mode without feeling too repetitive. Sure, it'll probably get repetitive after a hundred tries, but this is just one of the new features so expect more announcements in the coming weeks. Oh, and lastly, I do hope they allow online MyPlayer towers, like, getting random Create-A-Superstars from the Community Creations and assembling a tower for them. That's an idea to make things fresh and will allow us to view various customs we might not even be aware of. Here's to hoping WWE 2K19 makes leaps gameplay-wise, as I think the graphics have almost reached peak visuals. You can read more about the new mode including Tower types, Daily, Weekly and PPV-based Towers here. Keep refreshing SmarkHenry.ph for updates regarding the upcoming WWE 2K19 announcements as we continuously cover the latest details and information. Migz Llado is your supposed fashion guru and not-so young boy at the Smark Henry offices. A lover of everything music, wrestling, videogames and food, he lives his life tweeting utter nonsense (@the_migz) and ‘gramming random photos (@tha_migz) as he sets on his journey to completely do things without any prior explanation. When not being a smark at the Smark Henry offices, he lives his life pretending to be a professional architect and musician extraordinaire.